Can they just be flipped over? from //// to \\? Found this one during the Flock Of Cycles ride. This doozy is on Ellsworth at the corner of Bellefonte, outbound. This one is a hazard to pedestrians as well as cyclists. Think baby carriages, grocery buggies, etc. 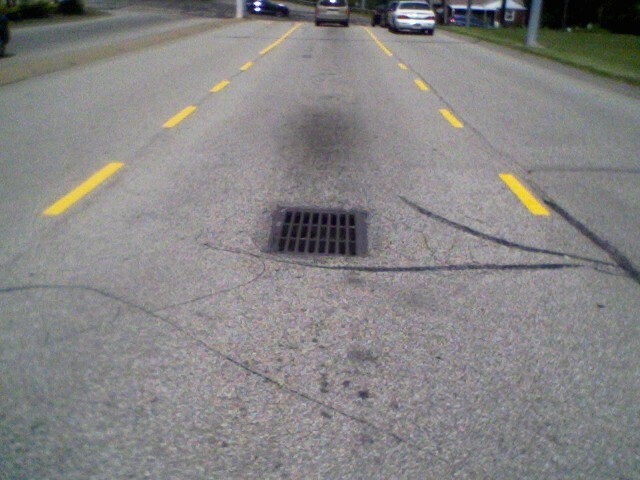 I need to take a photo of the storm drain at the corner of Ward St. and the Boulevard of the Allies. Seriously, that thing could practically eat both the bike AND the rider! Unrelated because it’s a big gap rather than a poorly-aligned storm grate, but still worth mentioning. And the thing that makes it worse is that it’s essentially right at the curb cut. Also, Stu, how do you manage to take a photo like that in the middle of a bike ride? Well done. I almost fell into that abyss at Ward & Boulevard tonight. Yikes. I like the photo Stu. It’s like ADA meets Pitfall. This one? (go into Street View) <–The on the SE corner? Yeah, there are a bunch of those out there, too. 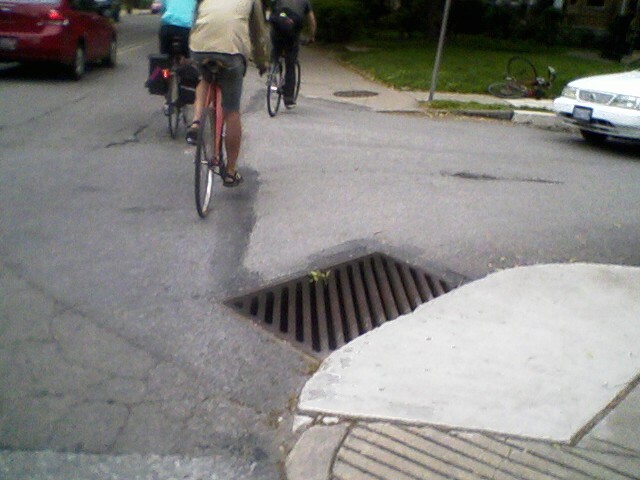 I recall during the Flock Of Cycles ride pointing out an example of a good drain grate. I just wish I could remember where that was! Flipping the Ellsworth/Bellefonte grate, while helping pedestrians with rolling things, would only exacerbate the problem for cyclists. That one simply needs to be replaced. @impala26, you’ll notice that I ditched the bike (photo background), ran back & took a quick cell phone photo. It always helps to have a bicycle and/or cyclists in the photo, to give perspective to how close we routinely come to disaster. This is how they’re supposed to look. This one is on Penn Ave at Stanwix Street, about 200 feet away from that horrible one. I wonder what it would take to switch out every troublesome grate in the area. Yeah, money, but how much? And what hoops would we have to jump through? This is the sort of change that would make our road system so much safer for cyclists. A one-time cost to fix something that stays fixed. iPhone proofed storm grates?? We’ll take eleventythousand please. Around where I live, whenever they’ve replaced or repaired a grate lately, it’s been with the “good” kind that Stu depicts above. Perhaps targeted 311 calls would help with the most egregious examples. I had good luck calling 311 a couple of months ago for the collapsed opening at the intersection of South Highland and Elwood. that 40th street bridge one drives me crazy… there are literally 40+ grates on that bridge and ONE of them is that way… how does that happen?! @mark, and I reported it through official channels in May 2009. So, like, c’mon guys, get on it already! You cannot see this thing in the dark, so as to avoid it. It’s on the northbound side, about 3/4 of the way across. I hit this one straight on yesterday. I didn’t wreck, but if I hadn’t had 80# in the tires I may well have gotten a pinch flat. Pretty much the same as walloping a pothole at speed. McIntyre Square exit lane to Peebles Road, Ross Twp. btw, there’s another just like it right at the corner where you turn right onto Peebles. At Fourteenth and Smallman, they’re digging up this inlet. I’m worried as to what they’re to replace it with, not that the old one wasn’t a deathtrap. @sloaps, I’ve been working on them to replace this for months. Finally all my letters paid off. They removed the grate all together and just paved over the hole. We have before and after photos. We’ll be publishing a blog post on it soon so that people know that the 311 system can and does work. You need a little patience and perseverance with it sometimes, but it does work. Nice work Scott. I specifically warn people to avoid the grates on Smallman when I give directions that way. Now I get to tell them to look for the newly paved over hole in the road. Score. I rode by here today and imagine my surprise when it was gone! That’s not a firetruck. That’s the truck that delivers crosswalks. As the pictogram shows. The fire station is on the corner of Penn. I’m still waiting for resolution of the 40SB grate that I reported in May 2009 via SPC (see about halfway down on page 1 of this thread). swalfoort, any idea who to tickle about that one? 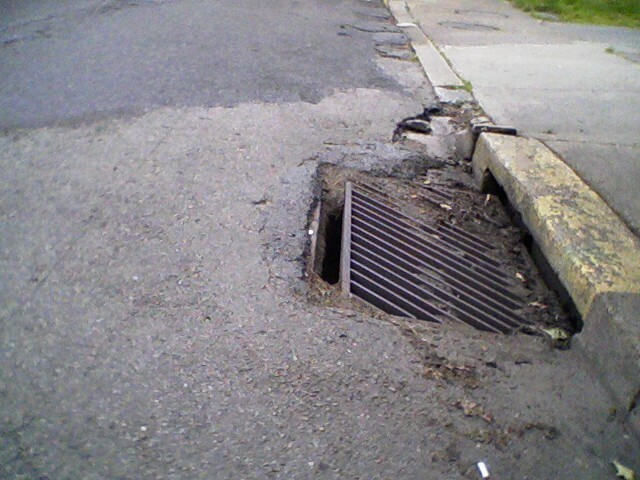 Just reported a dangerous drain grate to 311 near the corner of Ellsworth and Neville ave in front of 552 Neville House. It’s not too bad if you have fat tires, but it would eat up my road bike wheel. I’ll try to retackle the 40SB question, Stu. Can’t promise immeddiate results, obviously. We have a new one! On a just-repaved street, no less! This one is in West View, heading eastbound on Center (the way the 500 goes when it’s approaching W View but it turns right here, not left). You would hit this making a left turn from the left lane. What galls me is that there wasn’t a wheel eating drain grate here before they did the work! Or if it was there, it was a lot easier to avoid. Another point of reference: Scholl’s Bike Shop is just off-camera to the right, across the intersection. 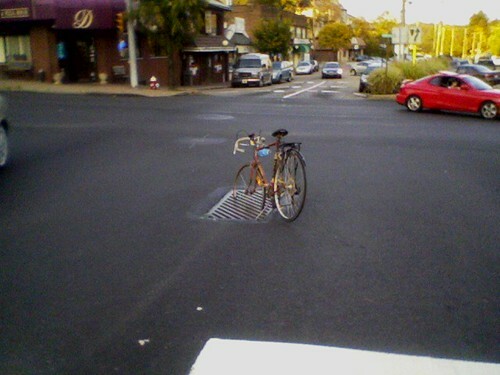 PennDOT will tell you that the diagonal slats mean that it IS a bicycle friendly sewer cover. I’ll have another chance to talk to them on Wednesday. I’ll see what I can do…. What they should do is read both pages of this thread. At the SPC ped-bike meeting this morning I raised this issue with PennDOT. They confirmed that they DO know that there are problems, and what good design is, but a) they can’t find all the problem locations on their own – so could we help them do so, and b) the new grates cost money, and that doesn’t grow on trees (est is $500 +/- per grate). But, at their request, I have started to compile a central list. I see I missed one or two from this list (my printer failed to print the most recent posts). Notifying PennDOT (and by cc the City and the County) of these issues is a first step. 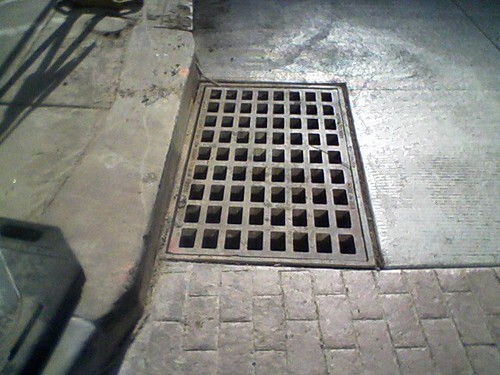 They may not be responsible for the grates in all cases (Pgh Sewer/Water may be, for example) but it will be one step closer to full documentation. Let me know of others that I’ve missed. I hope to send the first version of the list (to which I am appending photos) to PennDOT probably Monday of next week. They confirmed that they DO know that there are problems, and what good design is, but a) they can’t find all the problem locations on their own – so could we help them do so, and b) the new grates cost money, and that doesn’t grow on trees (est is $500 +/- per grate). This seems to conflict with Stu’s report that they repaved a road, and stuck a new wheel sucking grate in the middle. Inbound FORBES, between the cemetery entrance and DALLAS. There is a grate with deep gouges all around it. Its right around where the bike lane ends. I can try to get a photo of it on a morning commute if someone else here doesn’t beat me to it. – The 3365 Babcock and 0.1 past TRR are different, and I think the TRR one is more a hole than a grate, & so is a bit off-topic (holes are a different discussion). – The Liberty/Stanwix one is now fenced off. Just make a note that this had better get changed out or deleted altogether as part of the T project. – It’s just the one scupper on 40SB that’s sideways (northbound, about 3/4 across, curb lane). – The two exiting McIntyre Square, the one I photographed and another as you turn right onto Peebles that’s also in a big depression. Thank you Sara! PennDOT is complaining about $500 per grate? This is hilarious on so many levels. We’re talking maybe $10,000 total to make the lives of hundreds of people much much better. Give me a break, PennDOT. I’m amazed that it’s $500/grate. It’s just a hunk of cast iron.